NOW AVAILABLE FOR PRE-ORDER BY ACTION LAB COMICS! Preorder ABERRANT #1 with the Diamond item code APR181190. Preorder the special “William Dee Williams – Aberrant Works EVERY time” variant edition (by Issues 2-10 artist Davi Leon Dias) with Diamond item code APR181191. 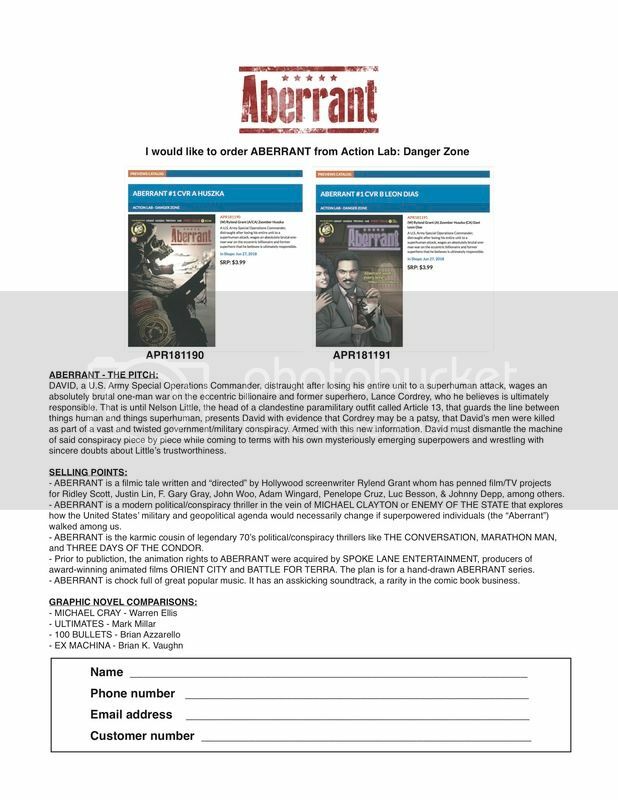 You can literally just print THIS FLYER, walk it into your local comic shop and tell them I WANT ABERRANT! And look for both in stores everywhere on June 27th, 2018. You can also have ABERRANT shipped directly to your house via MIDTOWN COMICS! DAVID, a U.S. Army Special Operations Commander, distraught after losing his entire unit to a superhuman attack, wages an absolutely brutal one-man war on the eccentric billionaire and former superhero, LANCE CORDREY, whom he believes is ultimately responsible. That is until NELSON LITTLE, the head of a clandestine paramilitary outfit called ARTICLE 13, that guards the line between things human and things superhuman, presents David with evidence that Cordrey may be a patsy, that David’s men were killed as part of a vast and twisted government/military conspiracy shockingly hatched by his former mentor. Armed with this new information, David must dismantle the machine of said conspiracy piece by human piece while coming to terms with his own mysteriously emerging superpowers and wrestling with sincere doubts about Little’s trustworthiness. Aberrant isn’t your run of the mill book about superheroes fighting supervillains. This is a book about political, social, and economic fallout in a grounded world in which folks with superpowers (or the Aberrant as they are called here) exist as a feared and misunderstood minority. This book explores how our entire worldview, our laws, our basic principals of governing and policing, and most importantly our concept of military might, would necessarily change if we woke up tomorrow and discovered that the Aberrant walked among us. Our bread and butter will be ripping a juicy real world event from the headlines – an Al Qaeda-affiliated mad man taking hostages at a natural gas plant in Algeria, for example (see issue 1) – and turning it on it’s head, re-imagining it in a world in which the superpowered could be lurking around every corner. Aberrant will be an arena in which we can wrestle with the bigger social, political, and economic questions of our day in a fun, heightened way. Don’t worry. I’m not looking to preach or push any sort of agenda here. My guiding principal in writing this book is that there should absolutely be NO black and white answers, no ultimate right or wrong presented. In politics, and with social & economic engineering, the truth always lies in some unsatisfying, ugly shade of grey. No one ever completely wins. Ultimately, EVERYONE ends up a little dissatisfied. I’m a screenwriter by trade. For over a decade, I’ve made my living writing action movies for directors like Ridley Scott, Justin Lin, John Woo, Luc Besson, and F. Gary Gray. Aberrant is going to be delightfully cinematic. My intention is to marry the poppy swagger of a Fast and the Furious movie with the commitment to weighty discourse we see in a film like Michael Mann’s The Insider.